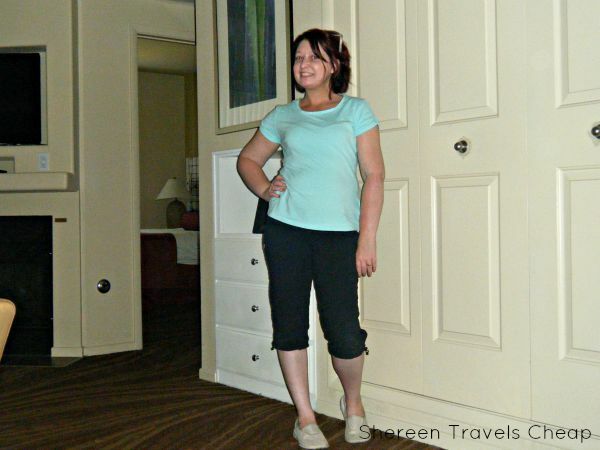 As long as I've been traveling light, it has gotten easier each time, but I still hear people saying they can't go carry-on-only, because of shoes or toiletries or whatever else. We spent over a week in Vegas last month and we did it with just one medium carry-on bag and a smaller, shoulder-bag carry-on...for the two of us. 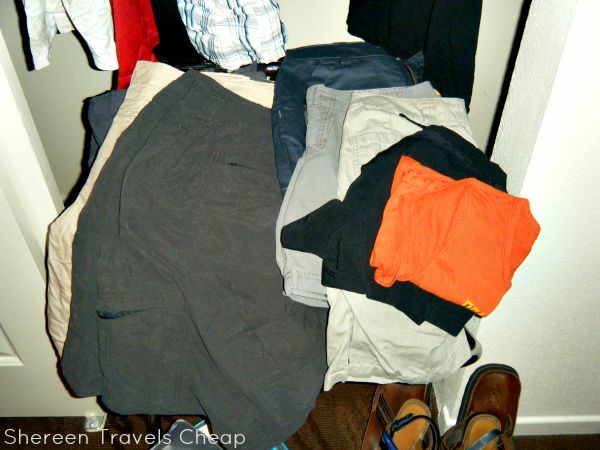 We have traveled with two carry-ons when we visited Europe (here's a link for men's travel wardrobe), but generally we try to get all our stuff in one, so we don't have to drag too many bags with us and we are able to just pick up our stuff and get on with our vacation. Everything you bring should work together. All your tops should go with all your bottoms and your shoes should be able to do it all as well. My plan starts the same: three bottoms, four-five tops, a dress (or skirt) and two pair of shoes. I make sure I have great walking shoes. One will be traditional and the other a bit dressy, like a good pair of sandals. If I can't walk a mile in shoes I've brought, they aren't good travel shoes. Generally, I wear my regular walking shoes on the plane, so the smaller ones go in my bag and take up less space. If you're going to the beach or like to spend time at the pool, I always suggest throwing a pair of flip flops in your bag as well. They hardly take up room and they are great for a lot of things, even if it's just going down to the hotel lobby. 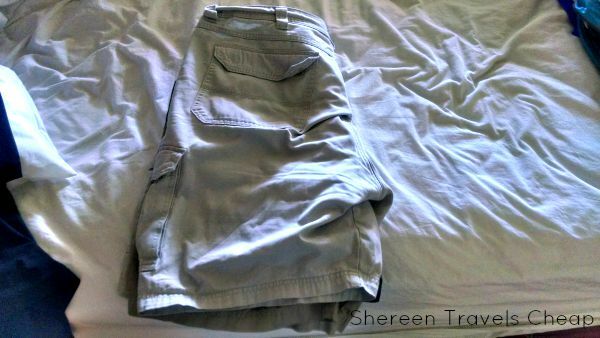 I used to roll everything individually, but I watched a video where a guy packed 20 t-shirts and some shorts and pants into his backpack and decided if it worked for him, it might work for me. So, on my last trip, I tried this technique. 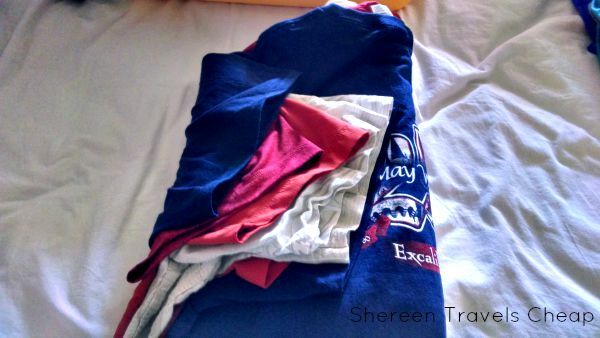 Take all your shirts and lay them out flat one on top of the other, fold them in half and then roll them into a bundle, do the same with your bottoms. 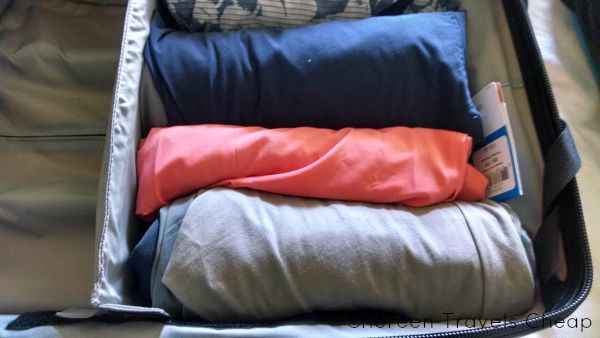 When you roll your clothes like this you can help eliminate a ton of wrinkles, all your stuff is together and it fits easier into your bag. Another plus is that you can get about 30% more into the bag than when you fold everything individually. Now, coming back, we had a few extra pieces and I was able to get it all in the bag even with no spare room (3 pair of shorts, 2 shirts and 2 dresses). Maybe you think you're already doing this, but I bet you aren't. There are crevices that can be filled with items and if you don't realize you're missing them, you probably think you need another bag when you don't. 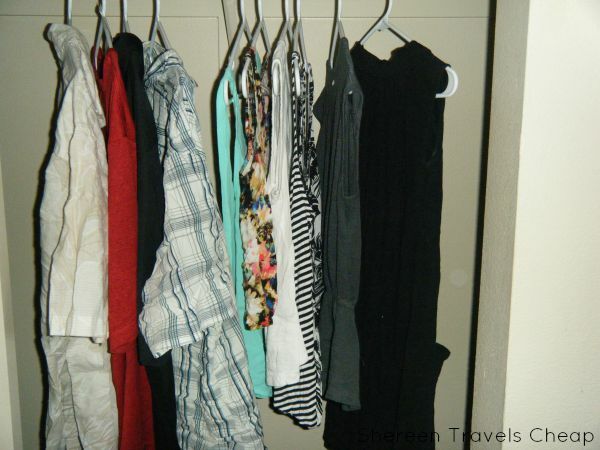 I squish socks, underwear, bathing suits and one-off items in these spaces. You can cram your hair straightener in there or your pajamas (mine are just a pair of running shorts and a t-shirt) or one of those packable shopping bags you like to have on hand for your purchases at the farmers market (can't be just me, right?). Unless you're going from cold weather to hot weather and need to bundle up, you can rotate those clothes into your wardrobe. I like to layer on the plane, so I'll throw on a cardigan and often a scarf, just in case it's cold on the plane or in my room or I need something to stave off the chill during a show. 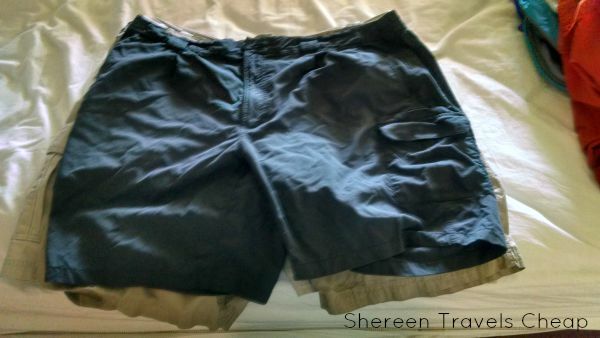 This works when going to Vegas, because you may need a layering piece inside, but that tank or tee you wore under it can be worn with shorts as well. You can be comfortable but still look like a person. I use one to keep the dirt from the bottom of my shoes away from my clothes and another for putting any dirty clothes in on my way home. 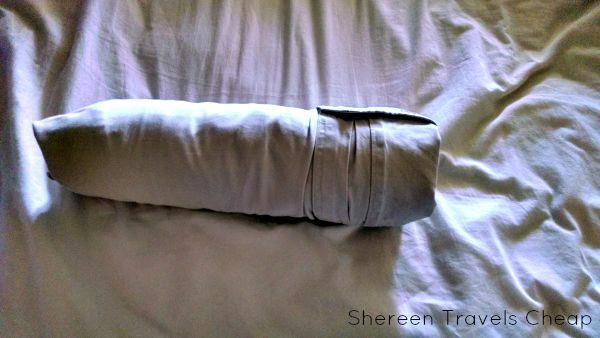 I use the same rolling technique as above with the bigger items on the outside and the smaller on the inside. That way, when you get home you can just dump the contents into the laundry. 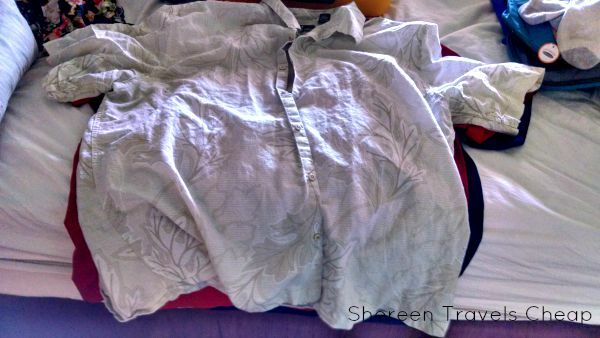 I don't love the thought of doing chores on vacation, but since I can make 15-20 outfits out of the mix-and-match wardrobe I've brought, I'm going to have to wear things more than once. You can pack a squirt bottle and a tiny bottle of vodka to spritz on your clothes to eliminate odors, but that won't deal with dirt or stains. You can just as easily bring powdered detergent and just throw everything in the wash, go have dinner, and then come back for it. 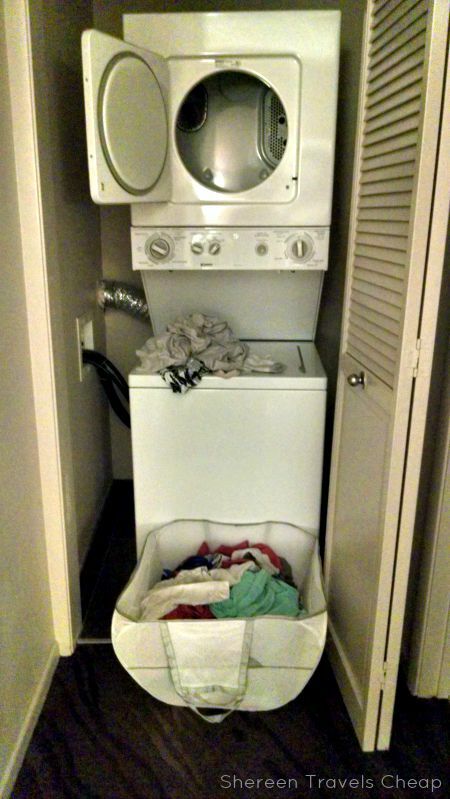 If leaving your clothes sounds sketchy to you, this is why I bring a deck of cards or several travel-size games. It makes laundry fun, especially if you have to sit in the laudromat. You will have downtime, so use it doing something productive. 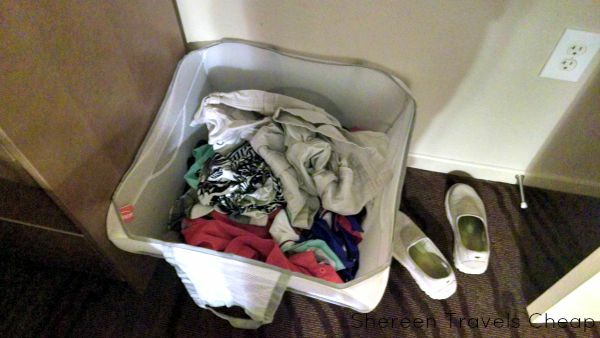 I always travel with a mesh, folding laundry basket. It doesn't take up much room, it works as a hamper and I can keep quarters in the pockets should I ever need them. It keeps all your dirty clothes together and off the floor, plus it's easy to take your clothes to and from the washer, no matter where it is. You know those straps on the inside of your suitcase that seem to get in the way when you're trying to zip it up? Don't ignore them. Use them to cinch all your stuff in place. Not only will compress stuff, but it'll make it easier to close your bag and keep everything from josteling around if you have any spare room in there (you know, for souvenirs). When I travel, I tend to throw a spare bag inside my carry-on (like this packable one or this crossbody that converts to a duffel) for extra purchases. 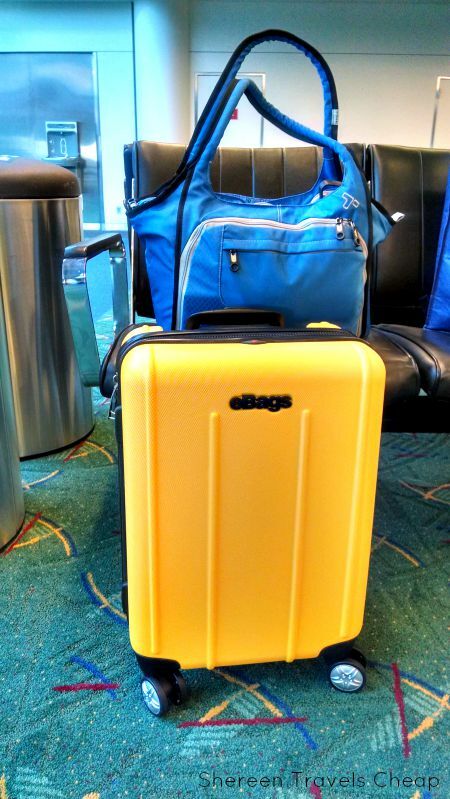 You can see how Eric's stuff and my stuff all fit into this great eBags hardside carry-on and things like our 3-1-1 bags, travel docs, snacks and laptop fit into my Travelon React Tote. I hope this helps you pack your own bag. 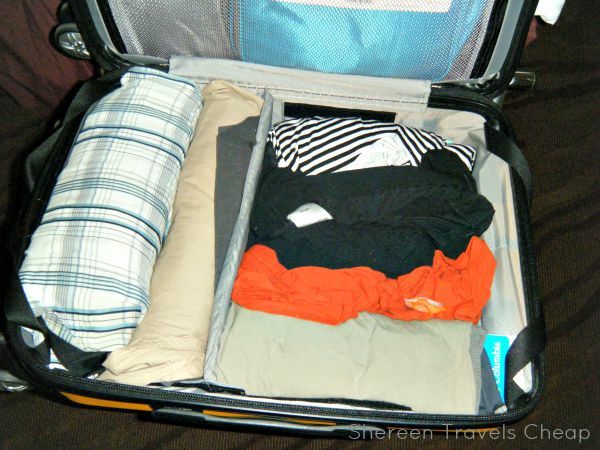 What are some of your packing problems and did I help you solve them?